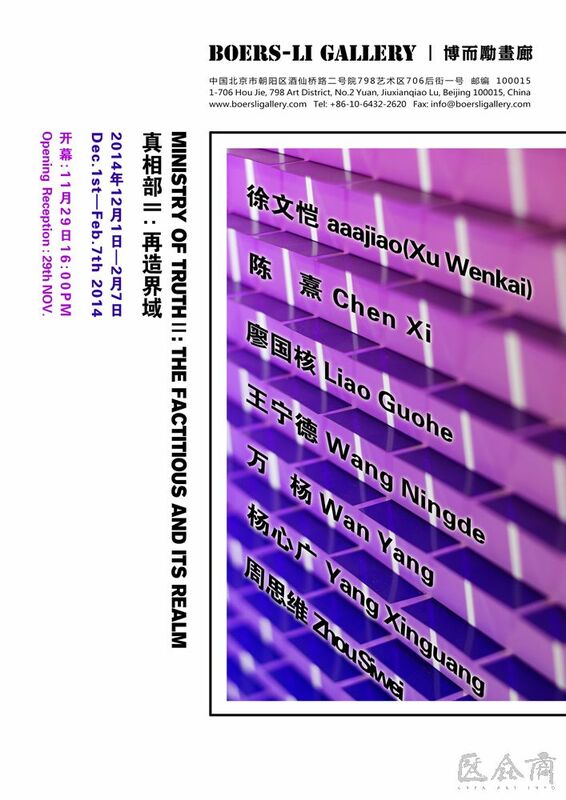 Boers-Li Gallery is pleased to present the group exhibition, “Ministry of Truth II: The Factitious and its Realm ” by artists including aaajiao (Xu Wenkai), Chen Xi, Liao Guohe, Wan Yang, Wang Ningde, Yang Xinguang and Zhou Siwei. The first episode of “Ministry Of Truth” was dedicated to artist researching the political components in their art practices; this second episode aims to explore practices founded on the factitious reality through representing its texture, surface and spatial relations in painting, photography and media art. Much of our understanding on artistic practices in the contemporary relies on a narrative or a context by which the work of art is created, while few inquiries depart from the perspective of the makers of the art works. The disparity between the reception and the conception of the artwork motivates our further quest for the “truth”. The artists’ practice is to create the factitious relying on their understanding of specific artistic medium. The factitious annuls truth and produces a new and solid definition of it, as much as it may be perverse, it functions to connect the sign to the signified that is fundamental to project the truth. Thus, this exhibition explores the concrete means and method in discovering the “truth” in the factitious reality we inhabit. aaajiao’s (Xu Wenkai) Object No. 5, is the last piece in his Object series, where the genesis of objects appear in three-dimensions is presented through a two-dimensional screen. The blue colour of the spinning blocks generated, are the signifiers of the start-up screen of the computer, suggesting the artificiality of the object. By virtue, the ubiquitous use of the screen in our present reality, and the content we perceive through it questions the “truth” generated and conveyed. To further emphasize the complexity of and within the screen, the artist expands the relationship between the screen and a fabricated landscape in Limited Landscape, Unlimited to exemplify the finishing touch of “Object” series. Inside the frame, a virtual landscape rises and sinks at sea, duplicating the possible meanings of blue screen-like background. Chen Xi’s water colours in the series, Details of my abstract paintings that forms a parallel world composed of machines are imagined landscapes of the fictional world. The making of these images are dictated by the aesthetics and will of the artist, which constitute of certain patterns of colours that fill up the entire image. Even though the artist admits to assigning a scenario to each image, yet the images can equally exist without its contexts. Moreover, unlike Rudolph Stingel’s “Instructions on making abstract painting”, Chen Xi prints out the process by which these abstract images are created in order to demystify the making of “abstract art”. For Liao Guohe, the “truth” of painting lies in the ironic process to excel and reduce its content and form. While his formal renditions of the image may persuade the viewer on the artist’s commitment of the medium, yet his use of language undermines the forthright message of the image. Like many of his paintings, while making references to the understanding of his medium, Liao challenges it by subverting to its fundamentals. The Cloud paintings by Wan Yang inverses the relationship between the truth and the factitious, where one would imagine by examining and representing the details of an object would reveal its true constituents, yet such inquiry reveals an even more profound abstraction. Wan Yang took a photograph of the cloud in mid-air, and identifies all the colours through his naked eyes. He then recreates his perceived colour scheme and applies them onto the delineated areas to render the original image. The final “clouds” becomes drastically different from the cloud we perceive in reality, as its “texture” is being highlighted through this process. Wang Ningde’s Color Filter for a Utopian Sky and Thicket are the artist’s experiment to further push the potential of photography. One of the functions of photography is to represent a reality at a given time and place, yet this reality may only reveal a fragment of the “truth”. Wang Ningde has created a method of further disintegrate this reality. He enlarges his image, and cuts them into thousands of even pieces, placing the pieces on an aluminium backboard, and final image is revealed with the assistance of the light. Light, as a basic condition to expose an image, has thus transformed its function from illuminating a reality to an auxiliary condition to unveil the fragments of reality. By questioning the fundamentals in photography, the artist inquires into the function of photography and its ways of representation. Yang Xinguang’s artistic practice focuses on exploring accessible materials around him and transforming them from its natural state to a factitious existence. Yang’s altercation of the tree trunks transforms its natural state to geometric shapes. His practice is not only a process of subverting traditional artistic modes of expression, but also attempts to establish new ones. His five meters whipped paintings make reference to hand scroll found in traditional Chinese painting in terms of its format and performance, at the same time, the work poses a skeptical position to our precepts of image making. Zhou Siwei’s Sail series adopts an identical method for all the pieces simultaneously, so that each individual work is the beginning and the end of another. Zhou Siwei constructs his paintings utilizing a predetermined set of colors, forms and sequences. The process entails both repetition and randomness, while the outcome of each image does not conceal the artist’s subjective input to differentiate them. Purportedly the ordinary and banal images of the sail, rendered in three “states” assert a novel visual logic based on the manipulation and re-engineering of all its pre-existing structures. Interestingly, the layering the colors of the same forms may appear differently given different lighting conditions. Courtesy of the artist and Boers-Li Gallery, for further information please visit www.boersligallery.com.